Everyone with a smartphone knows the struggle to find the perfect spot for a profile-pic-worthy selfie. The light has to be right, your hair has to be cooperating, and the backdrop has to be pretty, while not distracting from your personal fabulousness. I can’t help with your ‘do or force the weather to cooperate, but I can tell you where to go snap the perfect pic this Thursday. A pop-up installation of Amazonian flowers will come to the Hale Building at the corner of Chestnut and Juniper from noon ’til 8 pm. This vertical garden, which will clock in at ten by ten square feet, is being hosted by clothing company Americae. “While most brands are telling women to be a certain way—independent, beautiful, strong, unique—Americae believes that you are already these things. You are our muse, the modern day woman. And you deserve a fashion brand that celebrates you and the life of color, vibrancy, and purpose you lead. 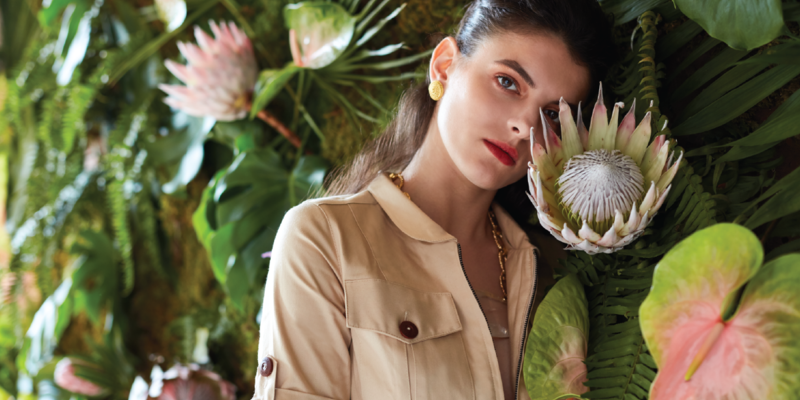 Our brand lives its commitment to you through our exceptional product and immersive experiences that reflect what moves us—the colors, vibrancy and femininity of modern Latin America. The vertical garden is being created by Philly-based artist Liz Barrella with plants and flowers native to the Amazon, celebrating Americae’s connection to Latin America. It’s part of their current visual campaign. “Americae is currently headquartered in Philadelphia and we wanted to bring the spirit and energy of Americae to the people who surround us everyday,” Americae spokesperson Allie Omdahl told Curbed Philadelphia.